Erich Wolfgang Korngold (1897-1957) was a child prodigy, a remarkable interwar talent in the musical life of German-speaking Europe, and in his later years, one of the most famous figures in Hollywood's musical establishment. He is remembered today through his many movie scores, but also for his operatic and instrumental music. 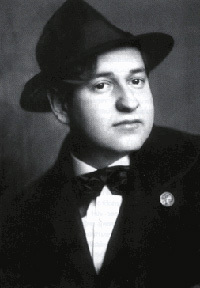 Erich Wolfgang Korngold, one of the most celebrated composing prodigies of all time and a pioneer in the development of the classical Hollywood film score, was born in Brünn, Moravia, on May 29, 1897, the second son of Julius Korngold and Josephine Witrofsky. The family moved to Vienna in 1901, and in 1904 Julius succeeded his mentor, Eduard Hanslick, as chief music critic for the highly influential daily publication, Neue Freie Presse, a position he held until 1934. Korngold's remarkable talents were evident from the outset. At the age of three, he could beat time with a wooden kitchen spoon; by five, he was picking out tunes from Don Giovanni at the piano and joining his father for informal recitals of two- and four-hand duets, and in his sixth year, he was jotting down musical ideas in a small notebook. A distant relative gave him additional keyboard lessons, but it quickly became apparent to Julius that the boy needed more systematic training, and so he sent him to Robert Fuchs, a composer, conductor, and professor of music at the Vienna Conservatory. During this period, Korngold learned theory, counterpoint and analysis, and the handful of pieces he turned out at this time are a clear indication of Fuchs' more traditional approach to teaching. In June 1906, Erich played several of his works for Gustav Mahler, who, upon hearing Gold, a cantata for solo voices, chorus, and piano, promptly declared the boy a genius and recommended that he avoid the rigors of academia altogether and study instead with Alexander Zemlinsky, known throughout the city as a composer and pedagogue, and as the principal conductor at the Wiener Volksoper. The lessons, which started in mid-1907 and lasted until the summer of 1911, when Zemlinsky left Vienna to assume the Directorship of the Deutsches Landestheater in Prague, provided Korngold with a solid grounding in harmony, form, voice-leading and orchestration, as well as the opportunity to improve his already impressive keyboard skills. In addition to a number of works for solo piano, including two large-scale sonatas, a suite of six character studies based on scenes from Cervantes' Don Quixote, and seven fairy tale pictures inspired by children's stories, Erich also wrote his first chamber composition, an ambitious four-movement piano trio. In April 1910, a four-hand arrangement of his ballet Der Schneemann (The Snowman) was presented at a charity gala in Vienna; that October, Felix Weingartner conducted Zemlinsky's orchestrated version at the Hofoper. The premiere was an unqualified success, and the piece soon appeared on some thirty stages in Austria and Germany. Before long, many of Europe's greatest talents were championing Korngold's music. In April 1910, Bruno Walter, Arnold Rosé, and Friedrich Buxbaum gave the Viennese premiere of the Piano Trio, Op.1; the following year, his Schauspiel-Ouverture, Op.4, received its debut performance in Leipzig, with Arthur Nikisch conducting the Gewandhaus Orchestra, and Artur Schnabel introduced the massive Piano Sonata No.2, Op.2, to Berlin audiences. In the fall of 1913, Schnabel joined Carl Flesch for the premiere of the Sonata in G major for Violin and Piano, Op.6, and the Vienna Philharmonic played the Sinfonietta in B major, Op.5, under the baton of Weingartner. Korngold completed his first opera, a one-act domestic comedy entitled Der Ring des Polykrates (The Ring of Polycrates), in the spring of 1914. The work was too short for a single evening's entertainment, so in order to prevent it from being coupled with an unsuitable partner, the composer provided a companion piece, Violanta, a one-act tragedy set in 15th-century Venice and based on a libretto by the playwright and novelist Hans Müller, an acquaintance of Julius' from Brünn and a frequent contributor to the Neue Freie Presse. Both operas premiered at the Munich Hoftheater in March, 1916, with Bruno Walter conducting; the double bill was repeated less than a month later in Vienna, with Selma Kurz and Alfred Piccaver in Polykrates and Maria Jeritza as the ill-fated heroine in Violanta. In an instant the nineteen-year-old composer had established himself as one of the leading figures in contemporary German opera. The First World War had relatively little impact on Korngold's creative endeavors. Although he was drafted into the army in 1916, he escaped active duty when a doctor recognized him and exempted him from service on the front lines. Instead, he maintained the company's archives, led the regimental band, and gave concerts and recitals of his own music to help raise money for the Austrian War Relief Fund. Two of his finest instrumental compositions, the String Sextet in D major, Op.10, and the incidental music for a production of Much Ado about Nothing, date from this period, as does his best-known and most successful work for the stage, Die tote Stadt (The Dead City), a three-act opera based on Bruges-la-Morte by the Belgian symbolist novelist Georges Rodenbach. After simultaneous premieres in Hamburg (where Korngold served as music director) and Cologne on December 4th, 1920, it moved on to even greater success in Vienna the following year, where Maria Jeritza sang the dual roles of Marie and Marietta. In November 1921, Die tote Stadt became the first German opera to be mounted at the Metropolitan Opera after the war. During the early 1920s, Korngold wrote songs, chamber pieces and, in response to a commission from Austrian virtuoso Paul Wittgenstein, who had lost his right arm in the war, a single-movement concerto for piano left hand and orchestra. His desire to get married and raise a family eventually led him to explore more lucrative artistic ventures. Much to his father's dismay, he concentrated on adapting and conducting the largely-forgotten operettas of Johann Strauss, Jr.; Korngold's arrangements and re-orchestrations of Eine Nacht in Venedig (A Night in Venice; 1923) and Cagliostro in Wien (Cagliostro in Vienna; 1927) helped spark renewed interest in Strauss' music shortly afterwards. Korngold's fourth, and largest opera, Das Wunder der Heliane (The Miracle of Heliane) occupied him throughout the mid-1920s. Although it enjoyed a moderate success in Hamburg in 1927, Heliane failed to win over audiences in Vienna and Berlin, most of whom expected another Die tote Stadt. Several backstage intrigues and a public row between Julius and supporters of Ernst Krenek's jazz-infused Jonny spielt auf also damaged the opera's reputation, but Korngold always regarded Heliane as his masterpiece. In 1929, Korngold began a long and very productive association with the famed Austrian producer and director Max Reinhardt, who invited him to collaborate on a new production of Die Fledermaus in Berlin. The two men had known each other for several years, and Korngold had previously declined a request from Reinhardt to supply music for a production of Schiller's Turandot, on the grounds that Puccini's opera of the same name was set to premiere, but this new partnership allowed the composer an opportunity to revisit an operetta he loved greatly. He and Reinhardt teamed up again in 1931 on Die schöne Helena, a German-language version of Offenbach's La Belle Hélène, for which Korngold composed an overture. With the Nazi ascendancy in the early 1930s, Reinhardt fled Europe, eventually ending up in California. In 1934, he asked Korngold to Hollywood to take part in a film adaptation of Shakespeare's A Midsummer Night's Dream for Warner Bros. The worsening political climate in Europe, and the gradual disappearance of a market for his concert and stage works as a result, provided Korngold with an excuse to accept the invitation, and in the fall of that year, he and his wife, Luzi, sailed for the United States. Korngold set about arranging Mendelssohn's incidental music, incorporating other pieces by the composer into the score, and in some cases, writing new, stylistically appropriate passages to link one cue to the next. He later described how after writing various musical sections out, recording them, and then playing them back on the set, he would conduct the actor in order to make him speak his lines in the required rhythm, a novel approach that most certainly stemmed from his years of experience in the theater. Over the next four years, Korngold traveled regularly between California and Vienna. In addition to writing the scores for Captain Blood, Anthony Adverse, Another Dawn, and the Prince and the Pauper, and contributing music to Give us This Night, Rose of the Rancho, and The Green Pastures, he continued working on his fifth opera, Die Kathrin. In January 1938, executives at Warner Bros. cabled Korngold, offering him the score to The Adventures of Robin Hood. Since Die Kathrin was scheduled to premiere that March, he initially declined, but the director of the State Opera urged him to take the assignment. Shortly after arriving back in Hollywood, Korngold received the news that Chancellor Schuschnigg had met with Hitler at Berchtesgaden; on March 13, the Nazis annexed Austria. The remaining members of his family, including his oldest son, Ernst, his parents, and his in-laws, managed to escape Vienna at the last possible moment. Within two weeks, the Nazis had seized all of his property. Although Julius had rescued a number of manuscripts, the vast majority of the composer's sketches and autographs were left behind. Luckily, two representatives from the publishing house of Josef Weinberger broke into the Korngold home, retrieved these items, and packaged them up for shipment to America. Korngold vowed to abstain from writing anything for the concert hall or opera house as long as Hitler, that monster in Europe, remained in power, choosing instead to support his familyas well as those displaced by the ravages of war and the organizations devoted to their assistancethrough the money he made as a film composer. In a career at Warner Bros. that lasted from 1934 to 1946, he penned a total of eighteen original scores, far fewer than, for instance, fellow composer Max Steiner, who routinely produced at least that many in a single year, and he won two Academy Awards. In his unique contract with the studio, Korngold set strict limits on the number of scores he would writeno more than two in a twelve-month periodand he asked to be able to turn down any project he decided was unsuitable. He also demanded, and was given, the right to reuse any of the music as he saw fit, provided it was not in conjunction with another motion picture, a clause that proved especially beneficial as he sought to revive his career after the war. Korngold's influence as a film composer cannot be overemphasized; indeed, he played a significant role in establishing the grammar and syntax of the so-called classical Hollywood film score at precisely the moment when its conventions were being formulated. Along with Steiner, he helped codify the use of clearly identifiable themes for characters, locations and situations, but unlike his colleague, Korngold employed subtle processes of thematic development as a way of drawing attention to relationships between individuals and the dramatic context in which they find themselves. Korngold also refined the practice of placing music just underneath the actor's speaking voice so that dialogue was always audible, and he specified which instruments would be most effective given that voice's distinct intonation. Lastly, Korngold's intimate knowledge of orchestral textures helped standardize the sound of Hollywood film scores. Working with such gifted orchestrators as Hugo Friedhofer and Ray Heindorf, who were able to translate his instructions perfectly, he created a striking aural complement to the visual imagery on the screen, one which greatly influenced a later generation of composers, including John Williams and James Horner. 1945 marked an important turning point in Korngold's life. His father, who had never been entirely comfortable in Los Angeles, and who had never approved of Erich's decision to focus exclusively on film composition, died after a lengthy illness. The war in Europe also drew to an end. Korngold himself had grown increasingly disillusioned with Hollywood and with the kinds of pictures he was being given, and he was eager to return to writing music for the concert hall and the stage. In December 1944, he gave his wife the manuscript for a third string quartet; the following year, largely due to requests from Bronislaw Huberman, Korngold began revising a concerto for violin and orchestra that he had started in the late 1930s, a work that Jascha Heifetz would premiere in St. Louis in 1947 and record commercially in 1953. In 1946, he also enlarged a cello concerto he wrote for the film Deception into a larger, single movement piece, and this was performed in Los Angeles and subsequently published as his Op.37. Like most of his fellow émigrés, Korngold longed for the day when he could return to Europe. The Vienna he and his family finally saw in May 1949 was substantially different from the city they left a little over a decade before. Although reconstruction efforts were well underway, many of the buildings that had been reduced to rubble as a result of the massive Allied bombings in March 1945 were still in ruins, including the Opera House. Family and friends had either left of their own accord or were victims of the Holocaust; a few who stayed even resented Korngold for sitting out the war in California. Moreover, a small cadre of Nazi sympathizers continued to occupy key social and cultural positions in Austria and Germany, and they were determined to prevent Jewish exiles from renewing their pre-war lives and careers. Despite all of this, Korngold remained upbeat about his prospects. In January 1950, Wilhelm Furtwängler gave the premiere of the Symphonic Serenade for Strings, Op.39, and the following month, the composer accompanied mezzo-soprano Rosette Anday in a performance of the Five Songs for middle voice and piano, Op.38. Arrangements were also under way to stage Die Kathrin, and the State Opera had agreed to mount Die tote Stadt. Buoyed by what he thought were positive signs of a belated comeback, Korngold began writing his next major piece, a four-movement symphony. Unfortunately, this optimism proved to be premature. The production of Die Kathrin, which had been postponed until October due to a strike, was not well received. Critics complained that the opera was old-fashioned and that Korngold's brand of overt lyricism was no longer relevant. In addition, the planned performance of Die tote Stadt was cancelled because of scheduling problems and artistic differences. Finally, adding insult to injury, a special concert of his music, organized by the Gesellschaft der Musikfreunde in April 1951, was poorly attended, and his former German publishers, B. Schott, Söhne, showed scant interest in reissuing any of the concert or stage works. Once he had been the talk of the town; now, Korngold felt that he had been forgotten. He decided it was time to take his family back to California. The director William Dieterle contacted Korngold in 1953, asking him about working on a film biography of Richard Wagner that was to be shot in and around Munich. The two had been at Warner Bros. in the 1930s, but Korngold accepted the offer largely out of a sense of responsibility to Wagner's music, which he feared would be subjected to the worst treatment. The project also gave him an excuse to be in Europe for the Viennese premiere of his Symphony in F-sharp, Op.40, in October 1954. The piece was under-rehearsed and Korngold pleaded that the performance be called off. While critical reaction was generally favorable, the composer was not satisfied. Sadly, he would not live to hear it played again. In the remaining years of his life, Korngold began working on a second symphony and considered writing another opera, this one based on Franz Grillparzer's Das Kloster bei Sendomir, but neither project was completed. In October 1956, he suffered a major stroke, and he died on November 29, 1957, at the age of sixty. Over the last three decades, Korngold's music for the concert hall, the opera house, and the silver screen has experienced a significant renaissance, thanks not only to the tireless efforts of his youngest son,George, who worked as a recording producer up until his death in 1987,but also to the extensive research efforts of Brendan Carroll, the composer's principal biographer. Almost all of Korngold's extant instrumental, orchestral and vocal works are available on compact disc, several of his most important pieces are regularly programmed around the world, and his film scores have enjoyed a renewed interest. Donations are processed by PayPal. No PayPal account is necessary.